Question: I have heard that it is possible to hook 2 110 breakers together and get 220 power. I have a welder that requires 208/230 volts, 50/45 amp, cycle 60, single phase primary. I'm trying to figure out how i can get fixed up to where I can use it without hiring someone and having a lot of money involved. don't have much o that to throw around at this point! :) Is this possible? and if so how? Thanks in advance for your time. Answer: Hi Wesley,Penny wise but dollar foolish. This is not the type of job you should be doing yourself to save a buck. 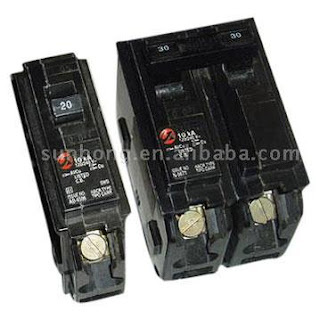 It is true that a 220 volt breaker uses the same space as two 110 volt breakers. You can't just double up two breakers to make it work. You need to purchase a special double pole 220 volt breaker to do this job correctly. You can not use two 110 volt breakers. A welder uses a lot of power. This can be a dangerous device if the power is not properly installed. I have a battery pack designed to charge from 220 but I am now in a country that has 110. Can I charge the battery pack on 110 and just take longer time to charge the battery? The battery pack is for a professional video camera and when charged properly lasts about 4 to 5 hours.